A little over a year ago I reviewed Hand of Fate, an action-RPG with deckbuilding strategy and a lot of tough choices. The concept was unique and clever—you create a deck from encounter and equipment cards, the dealer mixes in some nasty ones of his own, and then a dungeon path is dealt out for you to traverse, making risky decisions and fighting real-time battles along the way. Unfortunately, the experience got bogged down by frustrating balance issues and repetitive combat. Now, Defiant Development has announced Hand of Fate 2, a more nuanced action card game that puts the emphasis on smart deckbuilding, and the original game’s good idea may get the execution it deserves. I got a chance to play an early demo at GDC last month, and I was pleased to find tweaks to the deckbuilding, the encounter designs, and the decisions the player needs to make. The sequel doesn’t feel drastically different, but focuses more on improving and expanding the concepts and systems of the original. Hand of Fate 2 is basically a board game with a series of Oregon Trail-style encounters, each of which gives you dialogue options and choices—the more risk you take the greater the reward. Some of those encounters drop you into combat, which is real-time and very reminiscent of the Batman Arkham games. Each encounter is represented by a card and the dungeon you’re exploring is randomly dealt from the top of a deck, but you get to choose the majority of the cards in that deck, giving you certain level of control over which encounters you may run into. My companion Malaclypse chimes in before a fight. Each level shuffles in its own unique cards on your way to the final objective. In the first game, winning always meant killing a boss, but now you may need to get a certain amount of gold or survive up to a certain point in the dungeon. The deeper you go, the stronger your character grows, but death resets you to square one. As you complete encounters, you’ll permanently unlock better cards to add to your deck the next time around. The new encounters gave me a greater sense of involvement, both as they were happening and in terms of how you build your deck around them. It can be as simple as being given a choice as to which side you’ll fight for in combat, but could also be more complex as I started noticing the greater care with which Defiant has made some cards affect others. Hand of Fate 2 introduces the addition of cards that let you acquire companions. These NPCs will help you during fights (my companion for the demo, Malaclypse, would occasionally give me a magical shield) but they’ll also chime in for certain dialogue options outside of combat—but only if you’ve included both the companion and the specific cards they can participate with in your deck. There’s a greater emphasis on building a deck around a specific strategy, rather than just piling all your best cards in and hoping to draw them before it's too late, as was often the case in the first game. In fact, Hand of Fate 2 explicitly makes that more difficult to do by making more powerful cards either ‘silver’ or ‘gold’, and then limiting the number of each type you can have in your deck at a time. It’s another question of risk vs. reward: do you rely on drawing that killer gold card or build a more reliable strategy around worse ones? Silver cards promise better rewards, but you can only have a limited number in your deck. For all that’s improved, some of the same problems that made me tire of the first game are still kicking around—namely, the combat, which hasn’t changed much. Fights are often just about spamming the attack button while occasionally adding a finisher, dodge roll, or counter to the mix. Hand of Fate 2 has made the special ability system more interactive by tying it to your combo counter, which is a welcome but ultimately minor change. Combat encounters can now also feature objectives that aren’t just killing everything (I was pit against an infinite wave soldiers and had to survive for a certain amount of time) but the fights still played like the same aimless hacking and slashing I remember. Whether the combat becomes dull again will really come down to how much encounter and enemy variety has been added, which I didn’t get enough of a sense of during my demo. Defiant told me that, at one point, Hand of Fate 2 had a combat system more like that of Dark Souls, and that it was eventually scrapped because it didn’t feel like Hand of Fate anymore. 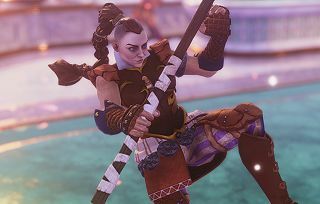 But I was never overly enamored with how Hand of Fate’s combat felt, and part of me wonders if a shift in style would have actually been welcome. The combat screen looks pretty much identical to the first game as of now. More positively, the gorgeous environments from the first game are very much back. A lot of care and detail has clearly gone into the level building. In one encounter, I was dropped into the back alley of a vaguely Warhammer-esque city and it truly felt lived in, part of some larger urban sprawl I couldn’t see. Although the area you’re able to move around isn’t very big, there were lots of small details like lampposts and abandoned shop stalls visible in the distance. Water and lighting effects continue to dazzle, to the point where it’s a shame that you can only admire them while hacking away at undead. Hand of Fate 2 adds depth and variety to what was already a cool concept, which is encouraging given my grievances with the first game. I can’t be sure yet if the sequel will fully overcome the original’s problems when it releases in early 2017—the humdrum combat especially—but it’s already looking like a better game thanks to the added deckbuilding and decision-making nuance. There’s nothing else quite like Hand of Fate out there, so it’ll be interesting to see how Defiant ups the ante on itself. Hand of Fate 2's level art continues to be breathtaking, if only briefly visible.